How to Master Meetings #Infographic ~ Visualistan '+g+"
People spend a lot of time in meetings - nearly a third of the work week is spent preparing for and attending meetings. And how often do you walk out of a meeting feeling like you actually accomplished something? Most of the time people say they feel like their time in meetings was completely wasted - either because of redundancies that could be taken care of more efficiently through digital communication or because of technology failure that wasted everybody’s time. If you want to make the most of your meeting time you’re going to have to plan ahead. Set clear goals for meetings, set time limits, and make sure everyone knows ahead of time why they are there. Most importantly, make sure your technology is up to date. If you aren’t using the latest collaborative tools chances are you are wasting time with technological issues and connectivity problems. 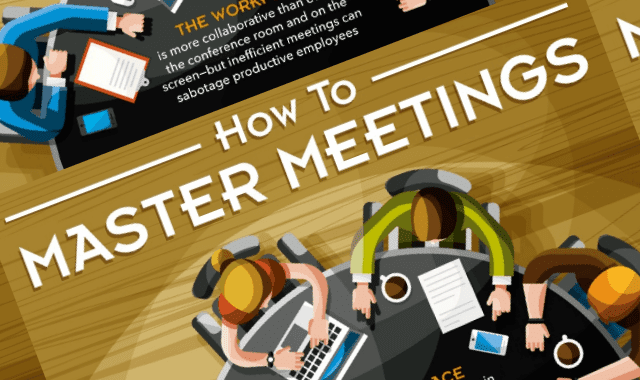 Learn more about how to master meetings from this infographic!